Gamification and behaviour-based strategies are innovative mechanisms to increase people’s motivations for saving energy and encouraging behavioural change for long time. Occupant behaviour in buildings is one of six influencing factors of energy-related building performance (EEA 2013), also including climate, building envelope, building equipment, operation and maintenance and indoor environment conditions. Clearly understanding and accurately modelling of occupant behaviour in buildings is critical to achieve a significant reduction of final energy consumption while promoting a behavioural change of energy end-users. People spend more than 90% of their time in indoor buildings (BPIE 2015). Occupants’ expectations of desired comfort within their indoor climatic conditions drives end-users to perform specific actions to satisfy their physical and non-physical needs (e.g. adjusting the thermostat settings, opening windows, turning on lights) (Parker et al. 2006). These specific actions affect directly the building conditions (e.g. indoor temperature, humidity level, CO2…), impacting in energy savings and energy costs. So, a building’s energy consumption can be 40% above expectations (Yu et al. 2011) due to the inefficient behaviour of its occupants. 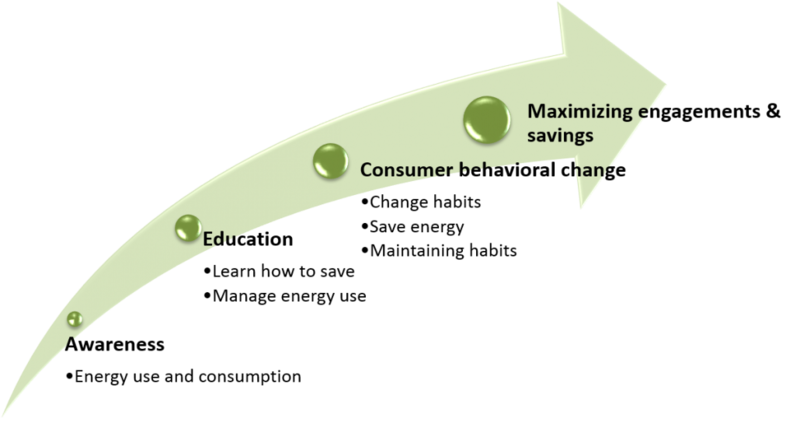 Therefore, energy efficiency activities should push the boundaries of the smart energy infrastructures by incorporating behaviour-based strategies for consumer engagement to motivate energy savings and behavioural changes in households. Thus, this publication addresses the behavioural dimension while engaging users to make energy efficiency approachable, rewarding, and fun while establishing long term and multi-faceted relationships with the households. “Can I do the behaviour?” (perceived control). From a technological view, ICT-based solutions can play a pivotal role in changing the behaviour of consumers, providing feedback and making visible energy flows (Froehlich 2009), enabling to educate, engage and empower occupants. The more visible energy information is, the more attention it gets from users, making them more aware about the impact of their actions in terms of overall comfort and energy savings and success indicators. Some references from the European Commission derive that three conditions are required to trigger lasting behavioural change that results in countable energy savings, which are: 1. A high level of information and communication; 2. The provision of economic incentives; 3. And a supporting administrative framework, such as regulated static vs. dynamic energy prices. The European Environment Agency (EEA 2013) says that behavioural change measures can deliver sustained savings of between 5% and 20% of total energy demand. These benefits come on top of the energy efficiency improvements that can be achieved by pure technological measures. From a psychological view (Berker 2008), user behaviour related to energy use is influenced by three factors: economic considerations; values, attitudes and norms; and practical daily life. In order to change energy consumption behaviour, routines and habits should be changed, broken and users should be aware of their energy use. Considering this, a combination of several measures for targeting end-user behaviour are: feedback, target setting and community-based initiative measures. But how can ICT help us to do this? We need to include a user incentive policy to motivate behavioural changes towards energy efficiency in energy end-users. And this can be achieved through the application of gamification as innovative mechanisms to increase people’s motivations to save energy and to encourage behavioural change. Gamification can support a closer interaction between consumers and households by making them feel rewarded and respected for their opinions and support of energy efficiency. Gamification encourages behaviour with instant and positive feedback (Bradley 2014) and enables a dynamic interaction with users and reward actions with a positive impact and promote the behavioural change of actions with a negative impact on energy. In order to help consumers in households to understand the impact of their actions on the overall energy use patterns and empower them to change their behaviour in order to reduce environmental footprint, we need to take advantage of existing infrastructures and tools while developing on top of it a set of behavioural change measures focusing on the engagement of consumers in order to achieve relevant energy savings while ensuring the range of users’ comfort. PEAKapp project fulfils all these premises and develops a unique ICT-to-Human ecosystem, which: 1. Triggers lasting energy savings through behavioural change and continuous engagement; 2. Enables increased consumption of clean and low-priced electricity from the spot market for household customers; 3. Connects them to social media and motivate them through serious gaming. A building’s energy consumption can be 40% above expectations due to the inefficient behaviour of its occupants. By incorporating gamification and behaviour-based strategies for consumer engagement will motivate energy savings of between 5% and 20% of total energy demand as well as long-term behavioural changes in households. PEAKapp provides a dynamic electricity accountancy system as the basis of real time monetary rewards for consuming electricity in times of high production. Berker (2008) Berker: Energienutzung im Heim als soziotechnische Praxis – Energy use at home as socio-technical practice. In: Fischer (ed.). Strom sparen im Haushalt – Electricity saving at home. München. 175-192, p. 179, 2008. Fishbein and Ajzen (2010) Fishbein, M. and Ajzen, I.: Predicting and changing behaviour: the reasoned action approach. New York: Taylor & Francis, 2010. Froehlich (2009) Froehlich, J.: Promoting Energy Efficient Behaviors in the Home Through Feedback: The Role of Human–Computer Interaction. In Proc. HCICWorkshop 9, pp. 0–10, 2009. Parker et al. (2006) Parker, D., Hoak, D., Meijer, A., & Brown, R.: How much energy are we using? Proceedings of the 2006 Summer Study on Energy Efficiency in Buildings, Asilomar, California, 2006.